Another, more obvious downside to the left nav flyout is its inefficiency: tap a hard-to-reach button, wait for an animation, scroll a list while scanning for the item you want, tap again, and wait for another animation. Your user doesn’t have time for that – don’t subject them to such nonsense. Having a lot of functionality and complexity in your product is no excuse. If your navigation has more than five items at the top-level, that’s just lazy information architecture. Too many choices is bad anywhere, especially on a 4-inch display. 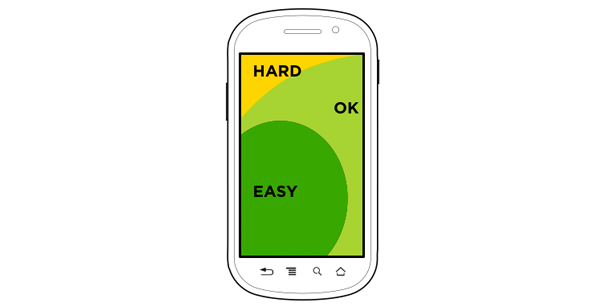 In an app with a flat information structure, users can navigate directly from one primary category to another because all primary categories are accessible from the main screen. Music and App Store are good examples of apps that use a flat structure. From Apple’s iOS 7 Design Resources. Can I admit here that I hate hamburger/basement navigation, I think we’ll look back on it with regret as a bad fad, and I’m not using it? In Instapaper, I really find it useless: the slide gesture to reveal the menu is not "interactive" (it doesn’t follow your thumb), and doesn’t feel like the standard iOS7 system gesture. I really hope the hamburger menu will progressively disappear from iOS apps: if we have bigger 5 inch iPhones soon, it will really become irrevelant and harder to use.